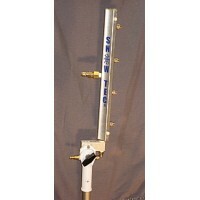 Snow-Tec's ST2 snow gun. 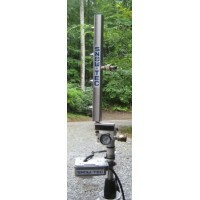 Designed for small air compressors & electric pressure washers! 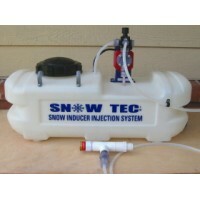 The perfect introduction to the world of home snow making. SNOW-TEC'S ST series snow guns are "external mix" and "custom built" to YOUR equipment specs. Our proven 10+ yr old design, ease of set up and NO adjustments means less time out in the cold messing around with a snow gun and more snow! 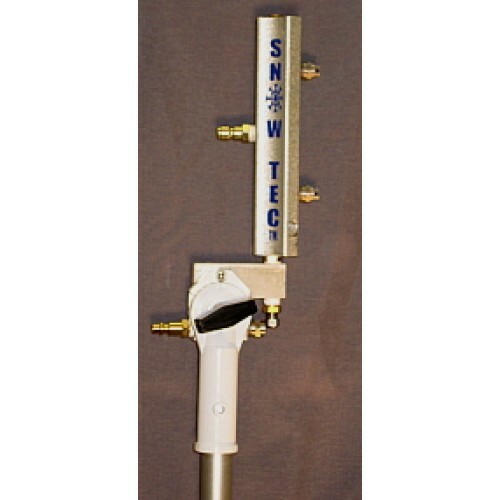 Snow-Tec snow gun bodies are solid 6061 aluminum. Aluminum will not rust and is a excellent heat sink, aiding to chill the water. Our custom CNC machined 6061 aluminum "nuk" manifold has been designed for precise air & water nucleation. Stainless steel nozzles, solid brass fittings and stainless hardware are the other main components. Our custom Aluminum pole mount allows for infinite tilt & swivel adjustments and will fit any 1"od or 25.4mm diameter pole. 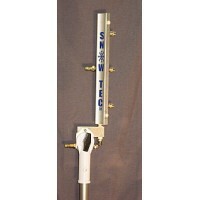 ST2 snow gun Includes: Set-up instructions, Snow making tips, Air line kwik connect insulator and wet-bulb chart to check for for accurate snow making conditions! AIR COMPRESSOR: 4.3cfm @ 90 psi. PRESSURE WASHER: 1.3 to 1.8 gpm. *Please submit your compressor, pressure washer specs and hose fittings in box's provided above the "add to cart" button when placing order. Or any Karcher electric pressure washer's w/ 22mm hoses.